Does raising rates really help in fighting inflation? According to the numbers released by the ministry of statistics and programme implementation last month, the All India Consumer Price Index (CPI) for August 2016 was at 131.1. Exactly five years earlier, in August 2011, the same index was at 92.7. The index has thus moved by 38.4 points in five years, at a compound annual growth rate (CAGR) of about 7.2% . Of the 38.4 point increase in the index over the last five years, the largest increase can be attributed to vegetables, which contributes 3.71 points . This is followed by housing, which contributes 3.55 points. Given the unclear relationship between interest rates and price changes in these commodities, it is not clear if the Reserve bank of India (RBI) will be too effective in using monetary policy to curb inflation. Following an amendment to the RBI Act in 2015, inflation targeting became the explicit goal of India’s monetary policy. CPI was chosen as the target, and the objective for monetary policy was to maintain annual inflation at 4% +/- 2% (or a band between 2% and 6%). When the newly constituted monetary policy committee decided to cut benchmark rates by 25 basis points earlier this month, it cited the fall in CPI as one of the motivations. Critics, however, have criticised the choice of CPI as the objective for monetary policy citing the heavy influence on the index of food and fuel, whose prices cannot easily be controlled by monetary policy. Looking at the factors that have led to the maximum increase in the index over a long period of time can help us determine whether this is a valid criticism. As discussed earlier in these pages (bit.ly/28QVEHy), along with the headline CPI number, the index numbers for each major component of the CPI are also released. By tracking these component-wise CPI numbers, along with their relative weights, over a period of time, we can understand the factors that have contributed most to inflation. The reason for using a long-period increase is to focus on factors that have contributed to inflation consistently. The choice of August 2011 as the starting point from which we look at the CPI increase is semi-arbitrary. In order to correct for seasonal variations, we need to look at the same month in a previous year for an accurate comparison. And 2011 is the earliest August for which numbers from the current CPI series (nominally dated to 2012) are available. The table above shows the top 10 contributors to the increase in CPI in our chosen five-year period, based on the number of points they have added to the index. This implies that these high contributors have both a high absolute increase in price, and also a high weightage in the index. 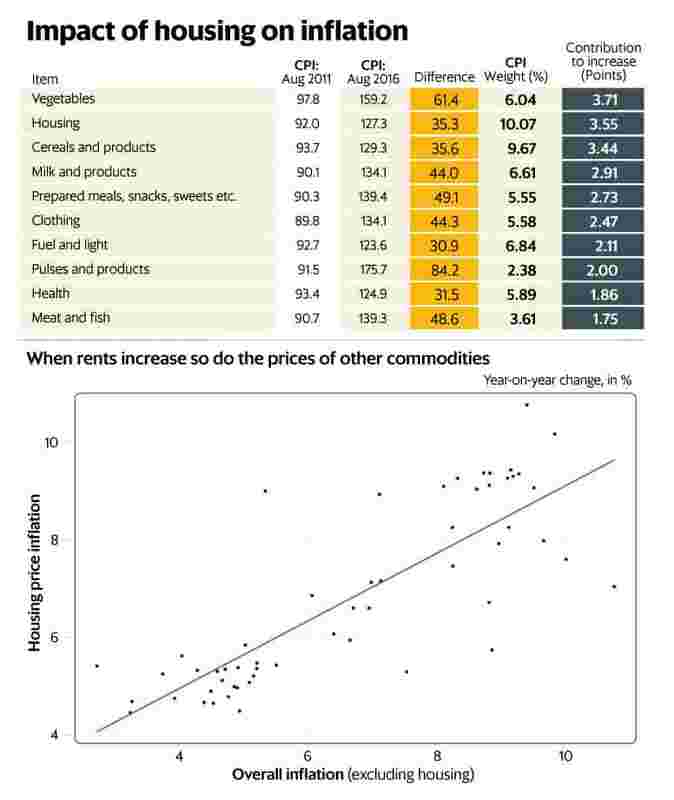 That vegetables top the list will surprise no one, but the interesting thing is that fuel and pulses are at seven and eight, respectively, especially given that these two commodity classes are reputed to have contributed significantly to the inflation numbers. Most other top 10 contributors are food products, lending weight to criticism that CPI may not be the appropriate number to target using monetary policy. The most interesting entry in this top 10, though, is housing, which is there mainly because of its weight in the overall index (at 10.07%, it forms the single largest component of the CPI). For urban CPI, its impact is even more outsized, at 21.67%. As we had seen a few months earlier, housing is part of the consumption basket only in urban areas (bit.ly/1q38ckT). In other words, the housing component of CPI is determined based on rentals only, and not on cost of house purchases. Over 13,000 empanelled houses are surveyed every six months on a rolling basis (so every month a different set of houses gets covered), and the rental information from this survey goes into computing the housing price index, which feeds into the CPI. Which brings us to the monetary policy, and how interest rates affect the price of rental housing. For starters, it is a well known fact that the market for purchase and sale of real estate is sensitive to interest rates, given that most property purchases are debt-financed. Thus, a higher policy rate can transmit to a drop in demand for purchase for home. This can affect the price of rental housing in two ways. Firstly, it puts downward pressure on the supply of rental homes, since higher interest rates dissuade people looking to buy a house for investment purposes. Secondly, people looking to buy a house stay longer in the rental market, putting upward pressure on rental demand. Both these come together to raise the market clearing price for rental homes, which then results in a higher housing index and consequently a higher CPI. In other words, given the weightage of housing, and that it is measured using rentals only, a higher policy rate can actually result in higher CPI. A caveat, of course, is that this is a long-term effect, since both the decision to purchase a house (whether as an investment or to live in) and the gestation period of real estate projects are fairly long. This doesn’t necessarily tell the full story, though. The idea behind monetary policy influencing prices is that higher interest rates result in higher spending on interest-sensitive factors which reduces demand for other items, which, in turn, results in a drop in inflation. In other words, spending on interest rate-sensitive expenses can crowd out spending on other stuff, which can mitigate the price rise. A simple way to test this would be to see whether the increase in house price index is positively correlated with the increase in prices otherwise. With a little arithmetic jugglery, we can “strip out" the effect of house prices from the CPI, and what we see is that inflation in housing is actually positively correlated with inflation otherwise (see chart). Maybe the critics of the current inflation targeting regime do have a point.